A new law on political parties will affect politicians and their supporters from across the political spectrum. 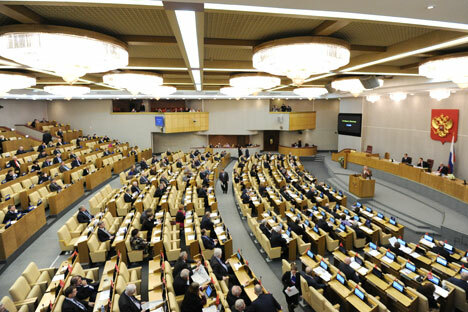 This week the Russian State Duma plans to complete the amendment process for the Law on Political Parties, which may lead to a sharp increase in the number of political parties in the country when it comes into force. The law, which reduces the minimum number of members for a party from the present 40,000 to 500, may go into effect as early as the beginning of April, and an impressive list of those eager to take advantage of the relaxed requirements has already formed. The Ministry of Justice reported last week that it had received 68 applications to establish new parties. Beyond the quantitative changes in the party system, however, there will inevitably be qualitative ones as well. But these will be caused not so much by the liberalization of the law as by the outcomes of the two recent federal electoral campaigns. The end result: Everyone will have to change. Even before the Duma elections, leaders of the ruling United Russia party began talking about the need for some fundamental changes. At the party’s Sept. 24 convention Dmitry Medvedev, who headed the party’s list in the December elections, stated that the party "was in need of capital modernization." Precisely what changes are needed is apparently not yet clear to either the party members themselves or their supporters in the Kremlin and the White House. Nonetheless there is ongoing discussion in the media about scenarios for reforming the party of power. The most radical one is the total elimination of United Russia and its replacement by a different party of power. This idea has a certain logic to it: it will likely be impossible to shed the label of the Party of Crooks and Thieves, which its adversaries have done so much to promote, and the burden of the sins of earlier times will make it even more difficult to win elections in the future. This version of events will likely not work in its pure form, however: instantaneously replacing one party of power with another is not even technically possible, not to mention the problems of legal continuity that would arise. Another scenario that has been spread through the media for some years is the division of United Russia into two or three major parties with different ideological leanings. It makes sense to pose the issue in these terms, since the party does bring together widely differing political views. But this scenario doesn’t look realistic either, insofar as it would force many United Russia Duma deputies to give up their seats in exchange for the opportunity to run "sometime later, representing another party." Therefore, the most likely way for events to unfold around the party of power may well be a combination of several scenarios. Radical rebranding is unlikely to go beyond replacement of some of the leadership and softening of the party’s previous uncompromising attitude toward the opposition. The change of signposts will most likely involve Medvedev’s election as the new leader, while the previous one, Putin, who noticeably distanced himself from United Russia during the presidential campaign, will go on ruling as "President of all the Russians,” relying on his All-Russia Popular Front established last year. Of course the Front is not yet much of a genuine unifying force, since it has just as many irreconcilable enemies as United Russia does. It must be said that the other parties currently represented in the Duma have just as many problems. On the one hand, the Duma elections should have instilled a certain amount of optimism in these groups; on the other, the presidential election campaign showed that the leaders of these parties have no particular reason to rejoice. The Communist Party needn't worry about its core electorate: sociological surveys show that a large number of Russians continue to favor the Communists and that the appearance of new parties is not likely to affect their sympathies. But if the Communist Party really wants to go somewhere, sooner or later it will have to take up the question of a leader. A new generation of voters is certain to be increasingly less willing to vote for Gennady Zyuganov, who is 67, yet political analysts are skeptical regarding the prospects for rejuvenation of the party. Just Russia has a different problem: Although many people cast protest votes for this party as the "least disliked,” sociologists report that it has practically no core electorate at all. The reason is that most Russians equate socialism with the Soviet Union. Therefore people who favor a socialist path generally vote for the Communist Party, which calls for a return to “the bright Soviet past,” rather than for Just Russia, which proposes adoption of the vague notion of European-style socialism as a model. Just Russia leader Sergei Mironov's low level of personal popularity only compounds the problem, giving ever greater credibility to the view that this party is headed for inevitable collapse. Not much of a rise is to be anticipated for three existing parties that do not have seats in the Duma. Judging by the most recent federal and regional elections, only the liberal party Yabloko, with its 3.4 percent of the vote and some prospects for increased support from the disgruntled urban population, has some chance of holding on in the big league of Russian politics. But the appearance of dozens of new parties, as a result of the reformed legislation on party-formation, will inevitably dilute support for the more established ones, and this will have the greatest impact on the extraparliamentary parties. For the Communist Party or the LDPR, the loss of a couple of percentage points merely means fewer seats in the Duma, whereas for Yabloko it could be fatal. Despite the expected pandemonium of neophytes eager for party registration, there are only three political forces of particular interest within the opposition. The first is the party of businessman Mikhail Prokhorov, which so far lacks even a provisional name. At the very least, it is distinguished from the others by the fact that its leader officially received the votes of 5.7 million Russians in the presidential election. Under current conditions, Prokhorov's party is quite capable of taking off like a shot in the upcoming regional elections, especially in the big cities. The People's Freedom Party (Parnas) will attempt to become a second significant player in the party field, if it gets registered. The Yeltsin-era democrats who joined this group were no doubt inspired by sociological data indicating that the greatest number of people in Russia have democratic sympathies. To be on the safe side, however, especially in view of the inevitable appearance of small spoiler parties on the right flank, this group will need to form a broad coalition with other prominent democrats. But Yabloko, for example, is not yet in any hurry to join this already proposed coalition, despite its own extremely dubious electoral prospects. Finally, there is a third and potentially high-visibility force that will certainly attempt to take advantage of the liberalization of party-formation, and that is the nationalists. To date, almost all of their attempts to achieve legal status have been in vain, not counting, of course, the short-lived triumph of the Rodina party, which entered the State Duma in 2003 with Kremlin support and moderate nationalist slogans. Today’s nationalists are kept out of the Duma and away from even the most innocuous meetings between the opposition and the president, while they are regularly rounded up at unauthorized street demonstrations. Given how widespread so-called everyday nationalism is in the country, however, supporters of the slogan “Russia for the Russians” do have certain political prospects. But those prospects will only turn into something if the authorities suddenly decide, for some reason, to abandon the current policy of harsh opposition to nationalists and separatists, whom they have criticized vehemently more than once. So far, a different scenario remains more likely: that the nationalist organizations are the ones the Ministry of Justice will persist in refusing to register, despite the relaxation of the law on party formation. At minimum, the motivation for such a posture can be found in the authorities' promise to at least constructively cooperate, if not make friends, with another recently emerged foe – the "disgruntled urban population." This article was abridged from the original version, which appeared in Russian in Kommersant.ru.